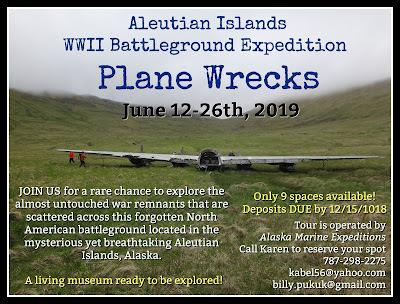 After our Aleutian Campaign Warbirds In Review Session at Oshkosh this summer, I had many people asking me about how they could be part a Aleutian Island WWII Historical Expedition. And actually, the tour company who handles all the details of our tour was too wrapped with their D-Day events that we did not have a tour scheduled for 2019. Not anymore.... Alaska Marine Expeditions and I decided this would be a great opportunity to create a special aviation themed history expedition through the Aleutians! I am happy to announce, due to popular demand, a WWII Battleground Expedition- Plane Wreck tour has been added to the schedule for the summer of 2019! 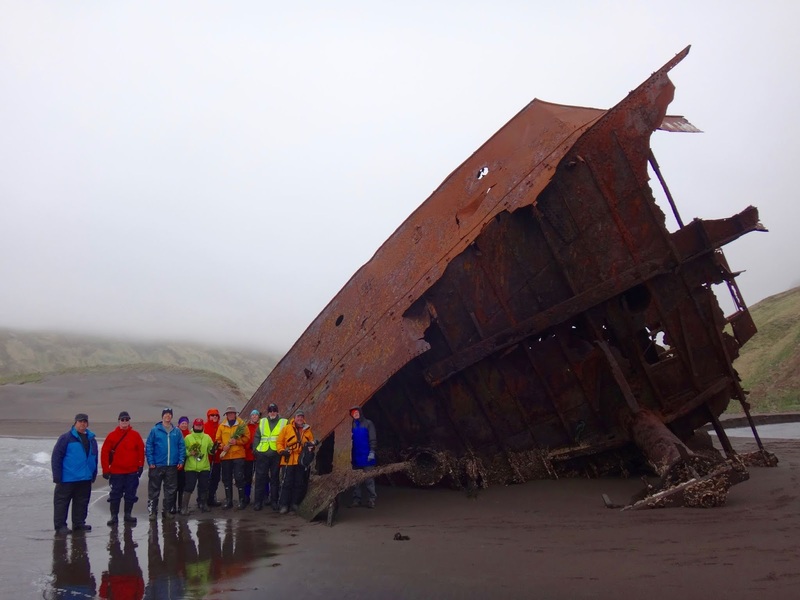 This tour will have many of the main sights we would normally see but we will spend more time exploring and hunting out wreck sites that we have not gone to before. Exciting stuff! For more information check out the event page and contact me with questions. In the meantime, here are a few (of thousands) of my favorite shots from our previous trips. 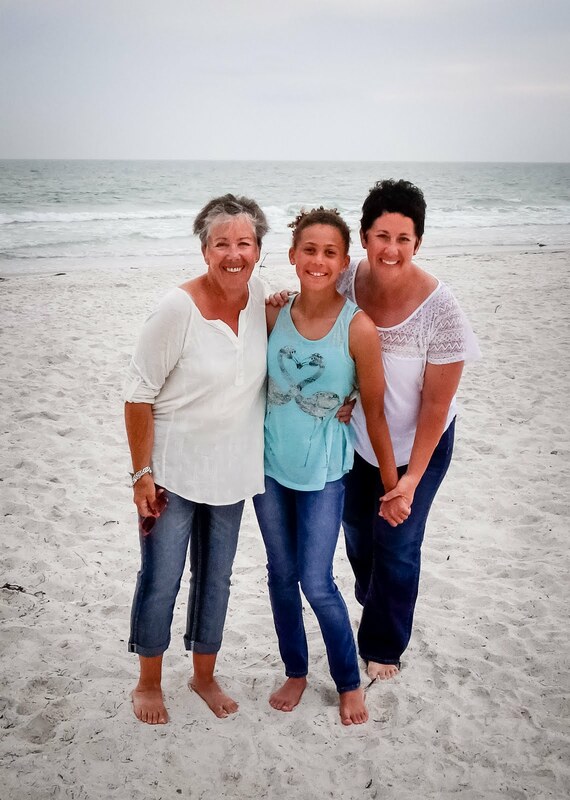 Experience of a lifetime! Pulled up marston matting on Alexai Point Airfield, Attu. 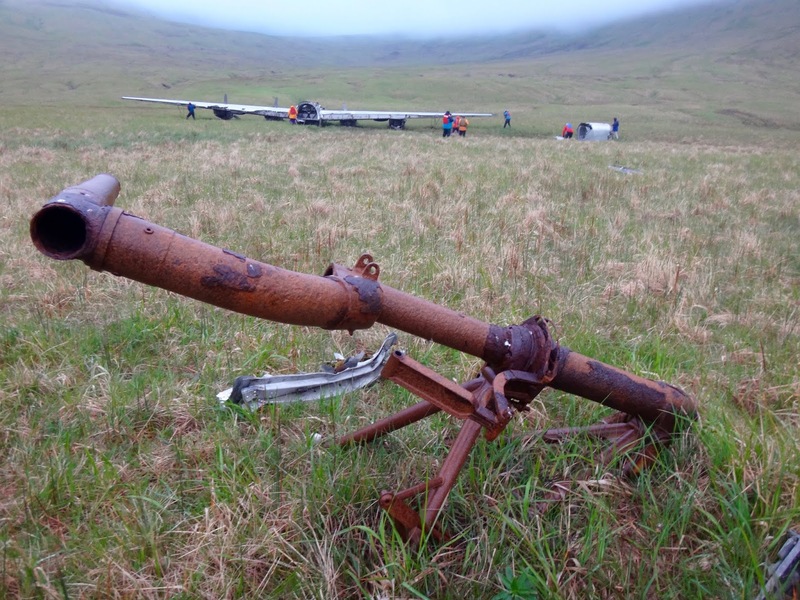 The wreck of a P-61 Black Widow on Umnak. Gun Emplacement attached to a network of trenches and buildings on Umnak. The landing gear of a B-24D on Atka. We had a visitor at the Japanese Sub Base on Kiska. Old WWII beechwood hanger on Umnak with Tuilik Volcano in back. The Officer's Club on Umnak. 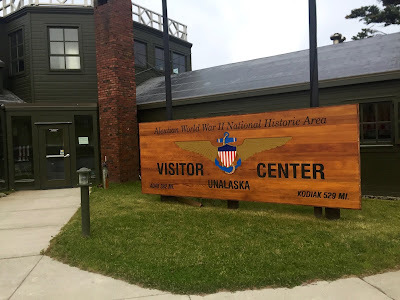 WWII Aerology Building now Aleutian WWII National Historic Area Visitor Center. 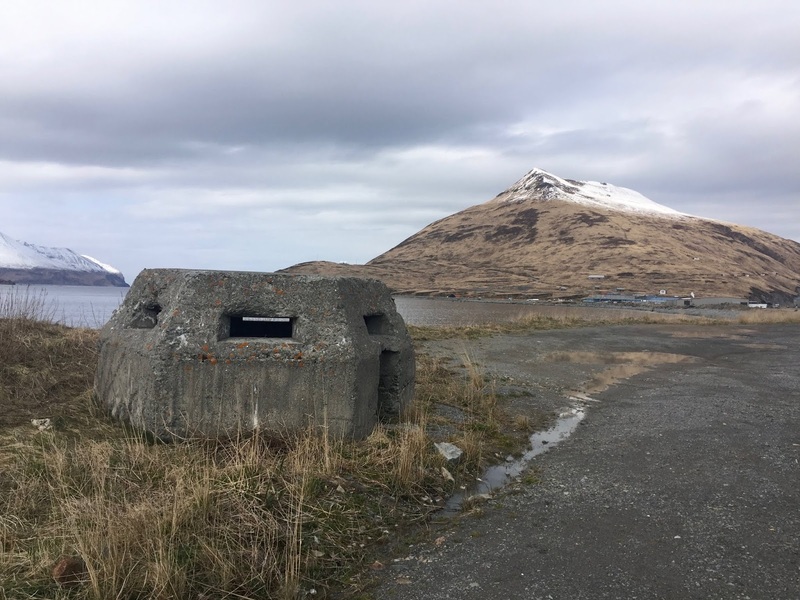 Dutch Harbor pill box. With Ballyhoo Mountain (Fort Schwatka) in back. The site of this 1942 B-24D crash site sits on the northwest part of the historic island of Atka along the Aleutian Island chain. 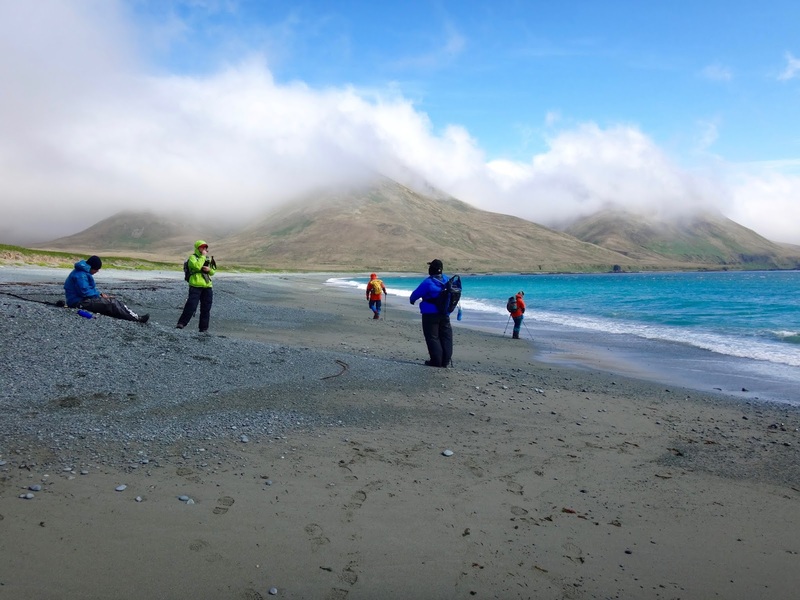 The small mountainous island is situated just 90 miles east of Adak and has a long history dating back 2,000 years with Unangax^ as its occupants. Around 1747 the Russians discovered Atka Island and made it a primary trade site while forcing the Aleut people to hunt and process the skins of seals and sea otters only to benefit the wealth and position of the Russians. The townsite of Atka was officially settled in 1860. 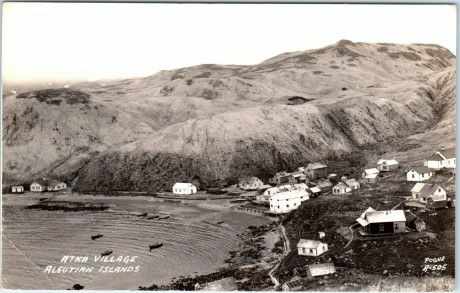 As with the other Aleut villages along the chain of islands the arrival of the U.S. military meant the evacuation of its people to relocation camps in the Southeast Alaska - sent to dwell in dilapidated fish canneries in a temperate rain forest and an environment completely unfamiliar to its new inhabitants. Meanwhile Atka was burned to the ground to prevent Japanese from gaining any benefit. Nonetheless, Atka residents fared slightly better than most as the US Navy reconstructed their village after the war and residents were able to return along with other Unangax^ from villages deemed too remote or unsustainable by the powers that be - sadly including those from battle filled Attu. The war had significantly changed the lives of the Aleuts forever. Today, sixty-one people call Atka Island their home with most living on the southeast side of the island. It was early morning December 9, 1942, when two pilots, Captains John Andrews and Louis Blau from the 404th Bombardment Squadron who were assigned to take high ranking officials, Brigadier General William Lynch and General Arnold's Inspector General on a weather patrol. 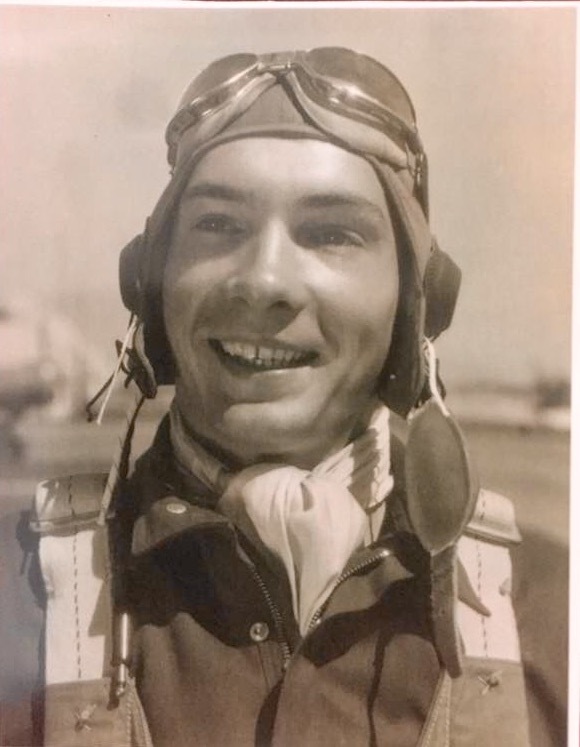 They wanted to see and experience for themselves what the pilots of the 11th Air Force were having to deal with - and experience the elements they did. Departing from Adak they flew to Attu to conduct reconnaissance on the Japanese occupation forces - and at the request of the generals extended their mission a bit too long. On the return, the once visible Adak airstrip had become completely covered in fog including the surrounding alternative island landing sites. 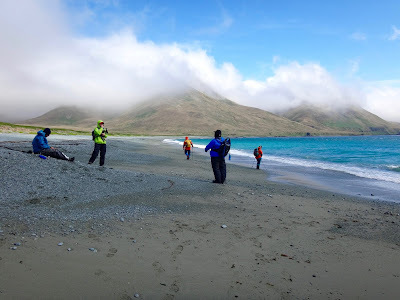 With no improvement in conditions and running out of fuel the pilot radioed for the latest weather report and learned Atka Island offered a small window of opportunity for emergency landing by visual approach. As the Atka runway was not operational yet the options were narrowed to either bail out or crash land on the tundra. After circling the island they found a level valley on the Northwestern side to glide the B-24D into. After 150 rough and painfully noisy yards it came to a halt. They all jumped out unharmed expect the bruised ego and broken collar bone of the General who had insisted on lingering over Attu. 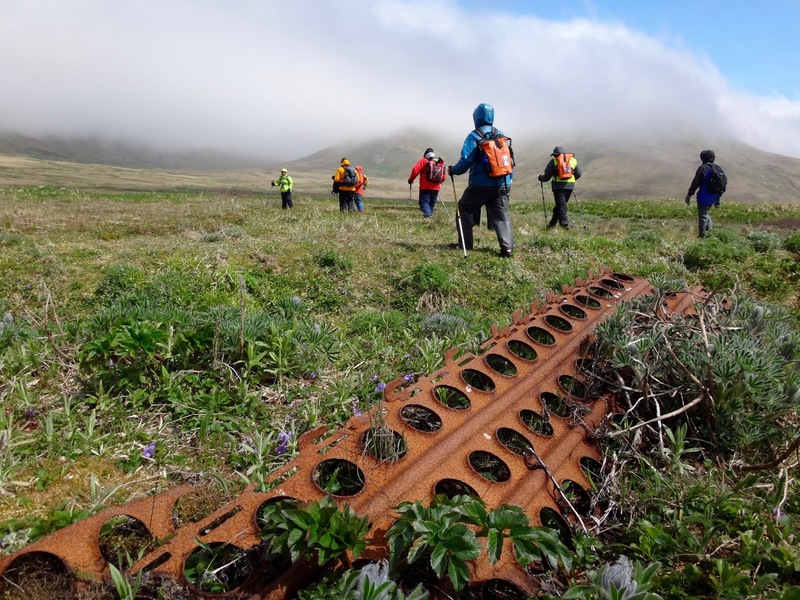 Although this plane sits on part of the federally protected Aleutian Island World War II National Historic Area sites, it has been scrapped over the years with people helping themselves to whatever parts they wanted to needed. Even so, it is still in great shape and has survived the harsh climate well. 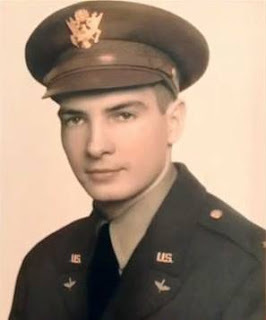 As we approach and the fog envelops the steep slopes surrounding the valley where it sits, it acts as yet another example of the dangers that Aleutian Campaign pilots faced every day. A few years ago, thanks to Ron Walker of Canada's West Coast, and his diligent work of data basing Canadian Military Aircraft, I was made aware that a plane my grandfather flew while in the Aleutians was now hanging proudly at the entrance to the Smithsonian's Udvar Hazy Center in Chantilly, VA. With very little RCAF history noted on their website, naturally, I contacted their curators to fill them in on the role of the plane during WWII. With the generosity of a dear client of mine, my daughter and I flew up there, with log books in tow, to meet with Russ Lee, Chair of the Aeronautics department. Upon greeting me, he mentioned that in his thirty years there, he can count on two hands the number of times someone had come forward with a personal connection to one of their aircraft. Needless to say, they were as thrilled as I was to be in contact. This was a special moment. During our meeting, we laid out five future objectives on how to update the exhibit to reflect the new information. Currently though, the Air and Space Museum is neck deep in a total remodel of their facility therefore some of the goals we laid out are sitting idle until the renovation is complete. P-40E Hope's Lope or as we know it, AK875 in the Udvar- Hazy Center. It is particularly interesting to me that this Kittyhawk (P-40E) AK875, is one of the aircraft to actually survive and be on display in one of the most prestigious aviation museums in the world. 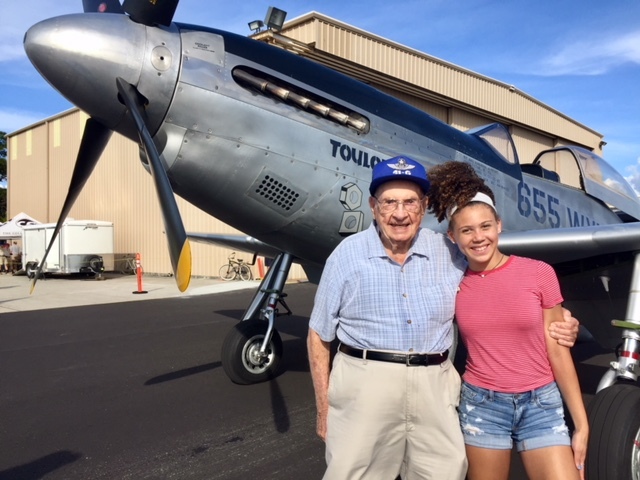 For my family, this has always been a special angel plane because it was in this very P-40 that my grandfather had his life saving ground loop at a refueling stop while en route to Umnak Island. This crash put the plane out of service and him on a transport. The rest of the formation would fly on with a majority of them fatally crashing into a mountain side when they got disoriented in the ever so dense and unforgiving Aleutian fog. 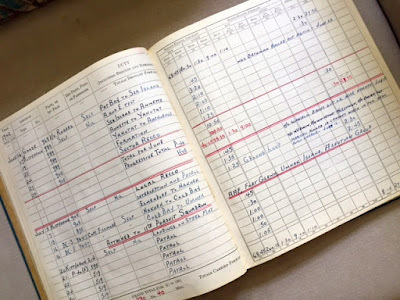 His log book entry of that day and the events that followed. P/O Lynch collection. For me, this plane lives on so that the stories of those it flew with could also. It reminds me of my purpose and that is to tell the stories of those who flew and served in the forgotten Aleutian Campaign. Last Sunday, on Canada Day nonetheless, I was blessed with the opportunity to fly out of the very same airfield as my grandfather did 76 years prior, Elmendorf Field, (Joint Base Elmendorf Richardson). It was 1942 and the RCAF had just arrived in Anchorage to commence joint operations with the U.S. Army Air Corps. Here is what their day looked like. 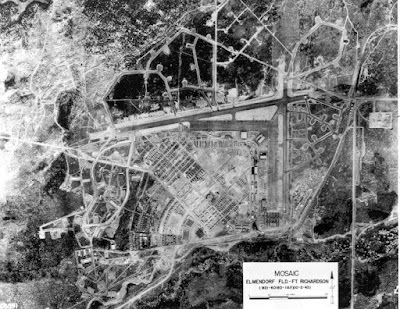 Elmendorf Air Field in 1941 roughly six months prior to the arrival of the RCAF. Elmendorf Air Field 2018, looking westward. 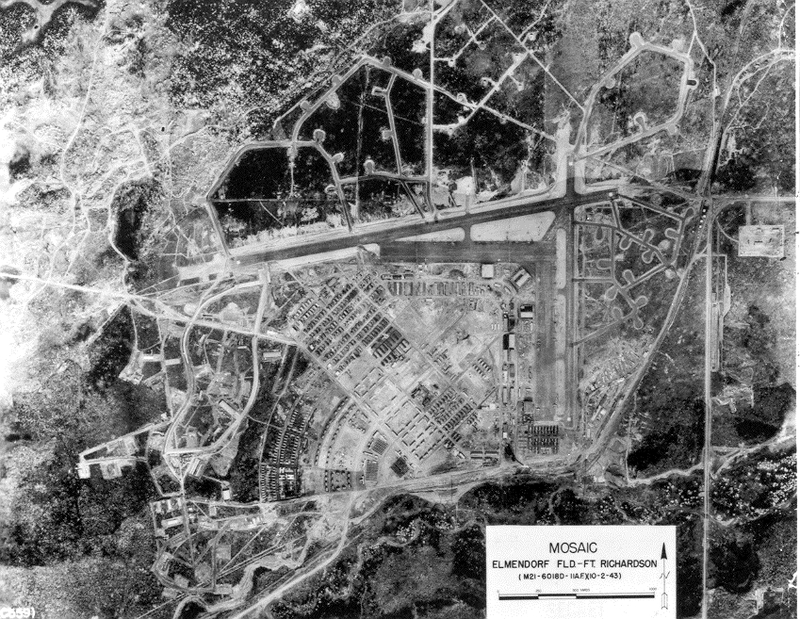 Our westward take off out of what is now Joint Base Elmendorf Richardson using the same WWII runways that my grandfather and his squadron would have used. Look closely and you will see the U.S. Air Force Thunderbirds lined up. They were there as part of the weekend's Arctic Thunder Air Show. Incidentally, "Thunderbird" was also the name of my grandfather's squadron; 111(F) Thunderbird Squadron, RCAF. Neat! RCAF P-40's flying over an Alaskan range. Photo courtesy of Maj. Fred Paradie. A surreal moment. Allies then and allies now. A humongous thank you to the Commemorative Air Force- Alaska Wing. Such a great group of people. 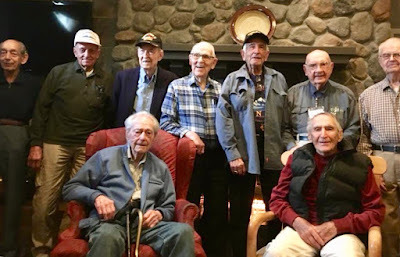 If you have an interest in WWII aviation or WWII in Alaska then I strongly encourage you to join the squadron and support their efforts in keeping the legacies of these warbirds and those who flew them alive. It was the best thing I have ever done!